Lotus QuickPlace is the leading self-service Web tool for team collaboration. With QuickPlace, teams can share a virtual workspace to communicate, collaborate, and coordinate. People can create and share documents and knowledge, discuss ideas, coordinate tasks, do project management, just to mention a few of the features that QuickPlace offers. QuickPlaces are created for a variety of reasons. They can serve as collaborative workspaces for teams, they can be created for projects that live only a limited time, and they can be used to help communicate and work together with people outside the company boundaries. 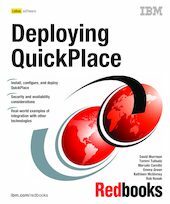 This IBM Redbooks publication shows you how to install, configure, and deploy QuickPlace in your organization. It gives step-by-step installation instructions for the QuickPlace server, and describes how to configure it to use the directories your organization already has. The book includes tips for planning your QuickPlace environment to be scalable, and describes how to install and configure QuickPlace clusters. Detailed instructions as well as examples are presented. Since QuickPlaces generally contain sensitive information, we discuss the security aspects of the QuickPlace server in detail and describe how to make a QuickPlace installation secure. And, because the number of users and QuickPlaces in an organization tend to expand quickly, we present techniques to manage this growth and the challenges it presents. The deployment of a new solution or product such as Lotus QuickPlace often starts with a pilot. We discuss issues you should consider when planning for such a pilot, and provide information on how to migrate a pilot installation into a full production environment. Examples of migration scenarios are also given. QuickPlace complements many other solutions your organization probably already has in place, and is designed to integrate easily with them. This book tells you how to extend QuickPlace by connecting it to other solutions such as Lotus Sametime, Lotus Workflow, and IBM WebSphere Portal Server.